There were 460 press releases posted in the last 24 hours and 153,501 in the last 365 days. 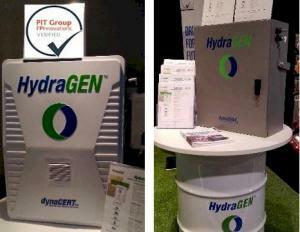 Pit Group Certified HG1 Unit in polymer case (left), rugged case (right). So effective is dynaCERT’s HydraGEN technology it is the Gold Medal winner of the prestigious 2018 Edison Award for Best New Product. NEW YORK, NY, USA, June 29, 2018 /EINPresswire.com/ -- dynaCERT Inc. (TSX-V: DYA) (OTCQB: DYFSF) (Frankfurt: DMJ) HydraGEN technology reduces greenhouse gas emissions by ~50%, and reduces particulate matter ~65%, all while increasing fuel-savings up to 19.2%, providing better torque, and lowering maintenance costs. Less than three months ago the Company launched its new Pit Group certified HG1 4.5T Unit & HG1 2.5T Unit targeting the diesel truck market and buses (class 6 - 8 engine) and feedback to date is off the chain. There is an excitement within the industry that is now translating into both new and repeat orders, putting dynaCERT Inc. on a solid growth trajectory. The growth trajectory has only just begun. The Company now has 25 dealers and agents worldwide covering all major markets globally. The latest corporate updates, June 21, 2018 "dynaCERT Announces New HG145 Orders and New Dealers" and June 7, 2018 "dynaCERT Announces Updates, New Orders, New Equipment Received for HG-2" included insight on new dealers, new and repeat HG145 orders, European homologation, future carbon credits, and the India bus market. The India bus market is particularly noteworthy as the overall potential is enormous; the total number of buses in India alone exceeds one-half million diesel-powered vehicles. dynaCERT has received an initial order for 114 HG145 units to begin servicing the India diesel bus market. Earlier this June-2018, with pollution levels crossing the dangerous mark in Delhi, the deputy chief minister called a high-level meeting with all concerned departments to discuss steps to combat pollution on a "war footing", tweeting "Air pollution is a serious health concern for Delhi. Have called a high level meeting today, to ensure work at war footing." Delhi woke up to the season's worst air quality, with commuters in several areas finding it difficult to find their way as the visibility levels plunged to nearly zero. Although anecdotal, similar scenarios are playing out in other cities across the globe, positioning dynaCERT’s technology as the single most effective and practical piece of equipment governments and businesses can adopt to meaningfully reduce both greenhouse gases and related particulate matter where diesel engines are concerned. dynaCERT's HydraGen units are essentially computerized on-demand electrolysis systems that supply the air intake of internal combustion engines with controlled timed releases of pure hydrogen and oxygen gases individually, creating a cleaner and more efficient burn. The system interfaces with the onboard computer of the engine -- the HydraGen™'s smart-ECU (the brains of the unit) can record the fuel savings and emission reductions while in operation, and provide an audit trail, essentially a greenhouse gas tracking system. The Company eventually plans to expand into the marine market, power generation market, and rail market. Technology that Pays for Itself: Governments and businesses that adopt dynaCERT technology not only display stellar citizenry (who doesn’t want to be seen as caring about the air people breath), the technology actually pays for itself; this May-2018 one user of dynaCERT’s new HG-1 units reported that its Class 8 trucks operating in the Toronto-Florida route achieving up to 17% fuel savings and 66% DEF reduction. The rate of payback in that particular scenario would be in under a year. HG-2 Unit Production Using New Specialized Laser Welding Equipment to Begin: HG-2 Units target the refrigeration container and light truck market. dynaCERT's HG2 unit is set to hit commercialization in July-2018 targeting initially refrigerated trailers. The size of the market for servicing the reefer container sector alone is massive and dynaCERT is expected to dominate as the only certified and recognized technology. Reports from people in attendance at dynaCERT’s recent Company AGM confirm initial feedback from preliminary units in the field are of such caliber and effectiveness that one prospective major user has referred the technology on to the actual container manufacturer for independent follow-up. It appears matters are shaping-up well for dynaCERT and 2018 will be looked back on as the year everything came together for the Company. Investors establishing a long position here in TSX-V:DYA are apt to be richly rewarded. This release may contain forward-looking statements regarding future events that involve risk and uncertainties. Readers are cautioned that these forward-looking statements are only predictions and may differ materially from actual events or results. Articles, excerpts, commentary and reviews herein are for information purposes and are not solicitations to buy or sell any of the securities mentioned.